A very impressive truck indeed. Based on a Mercedes-Benz 4148 Actros chassis the Dutch firm Hilton in combination with Plastisol built this giant. When you look at this size, you would think it's a large boom on top. The boom is only 22 metres long, so that's a little bit strange. 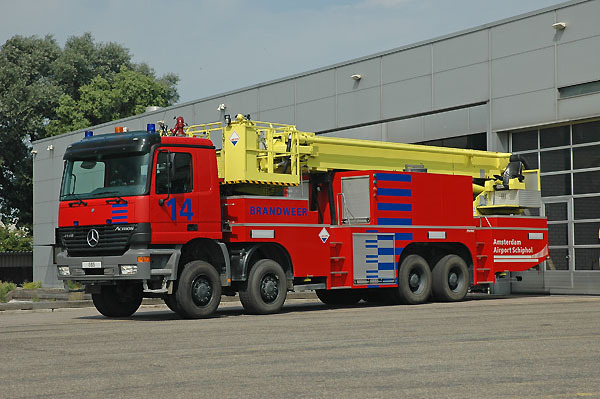 This vehicle is a combination of an aerial appliance and a water tender. There is a pump onboard with a capacity of 3000 l/m low pressure and a tank of 3000 litres of water. Very nice shot posed in the sun. I like it a lot. You don't see too many of these puppies in the States. Very unusual rig!!!! Added by George A. Fen on 27 August 2005. A Very nice truck. Looks very powerful. How many crew does it have? Added by Mark on 17 May 2006. I wonder what is the purpose of this appliance.Possibly it is used for evacuating passengers from aircraft which is crash landed at the airport. Added by Bomba 995 on 27 January 2007. Very impressive rig, and so different to North American eyes. Looked up Schipol Airport, Amsterdam - it is one big International Airport. All the buildings, parkades, aircraft hangers, etc would require fire protection and I think that is what this Engine does. Maybe it does back up Crash-Rescue, by bringing water out and/or providing elevated Master Stream with its tower for a really major crash-fire. 2-man crew, judging from the cab ? Added by Pat Rivers-Bowerman on 02 September 2008.